Pompeii wasn’t the only city wiped out by the infamous Mount Vesuvius eruption in 79 AD. Herculaneum, Oplontis and Stabiae were others and you can have the chance to explore these ruins with a private English-speaking expert guide from Italy’s Best. Your private driver from Italy’s Best will pick you up from your accommodations and bring you to the site where you’ll be greeted by your private English speaking guide from Italy’s Best. The remains of Herculaneum are incredibly unusual because the city was buried in mud, which preserved the structures and furnishings. 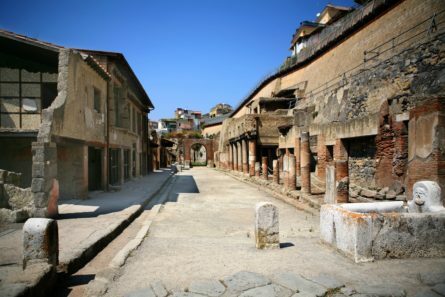 During your Herculaneum tour your expert guide will reveal the history of this marvelous site. Discovered by chance in 1709, the Greco-Roman urban landscape contains folding doors, peristyles, mosaics, paintings, household objects, and even the equivalent of a bank. The walls of the House of the Bicentenary carry the imprint of a cross, confirming that the Apostle Paul did indeed arrive in Pozzuoli in 63 AD. The Villa containing papyrus is unusual; it was the library of Caesar’s father-in-law, Lucio Calpurnio Pisone, and there were a limited number of shops. Oplontis was a residential centre for families and high-stature individuals. Excavations have revealed splendid villas with precious and exquisitely made jewels, the most renowned being Villa of Poppaea, wife of Nero, with its remarkably preserved architecture, decorations, frescoes and large and luxurious rooms. In Stabiae see the Antiquarium, eleven frescoed rooms with; floor fragments, vases and funeral objects as well as various sculptures and bronzes. Here lies the remains of the Villas of Arianna, Petreliune, Carmiano Sassole. Your last stop is Boscoreale where you’ll see remains from the cellai spaces for agricultural implements and barrels of wine, and the antiquarium which contains remains from all of the aforementioned town and thus offers detailed insight into daily Roman life. Following this, your private driver will bring you back to your accommodations.